Follow the route towards Arawata Saddle. After climbing about half the steep section below the saddle access is obtained to a snow shelf leading out to the south-east, which provides a straightforward route to the summit, with two pitches of steep, loose rock to the summit ridge. About five hours out from the hut. With glacial recession this route may be difficult or dangerous from ice and rockfall. J Strang & party, 1978. There appears to be no record of a complete ascent from Shovel Flat although the upper part of the ridge was climbed on January 16, 1970, by Brian Chalmers, Jill West, Judy Knewstubb, Rod McKenzie and Don Murray, who gained the ridge by traversing across the Christopher Johnson Glacier. 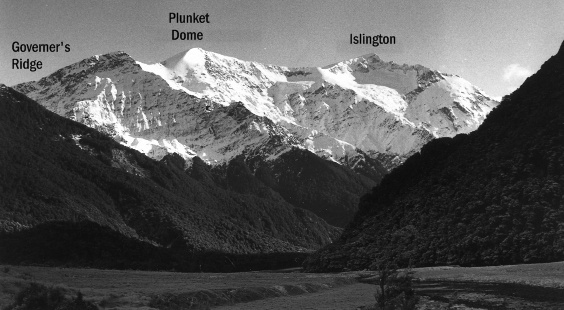 James Frater, David Gauld and David Smyth traversed the ice-field NE of Liverpool and Islington Dome from Arawhata Saddle then climbed the east ridge 18 January 1965.